On a Monday morning like any other, one young boy and his twin sisters discover a magical surprise right outside their back door. Growing from their beautiful maple tree are vibrantly colored, sugar-coated, delicious donuts aplenty! Turn each page and count along with the characters as they tally their tasty treats day after day. As the donut count rises beyond belief, discover the adventure that ensues for these clever kiddos. 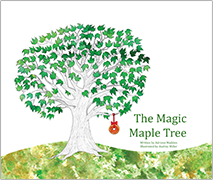 Step into this seemingly ordinary backyard and see how one Magical Maple Tree becomes the catalyst for an extraordinary childhood adventure!